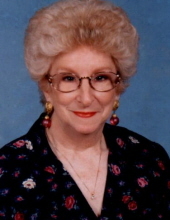 Mrs. Hendricks, the daughter of the late Archie Eugene VanAlstine and Myrtle Wallace VanAlstine, was born in Council Bluff, Iowa on June 8, 1933. She retired from the United States Forest Service and was an Army Veteran. She was a charter member of Women’s Memorial in Washington DC, past President of Republican’s Women’s Club and was a Kentucky Colonel. A founding member of Madison Hills Christian Church, Mrs. Hendricks served as church secretary for many years. She loved her dogs, grandchildren and enjoyed working in her flowers. Funeral Services will be conducted at 1: 30 PM Saturday, February 9, 2019 at Madison Hills Christian Church with Bro. Martin “Marty” Frazer officiating. Burial will follow in the Richmond Cemetery. Serving as Pallbearers are: Cameron Hendricks, Tommy Masters, E.C. “Bud” Cornelison, Shane Masters, Chris Young, Barry Gibson, Escoe “Bud” Robinson and James Baker. "Email Address" would like to share the life celebration of Connie VanAlstine Hendricks. Click on the "link" to go to share a favorite memory or leave a condolence message for the family.